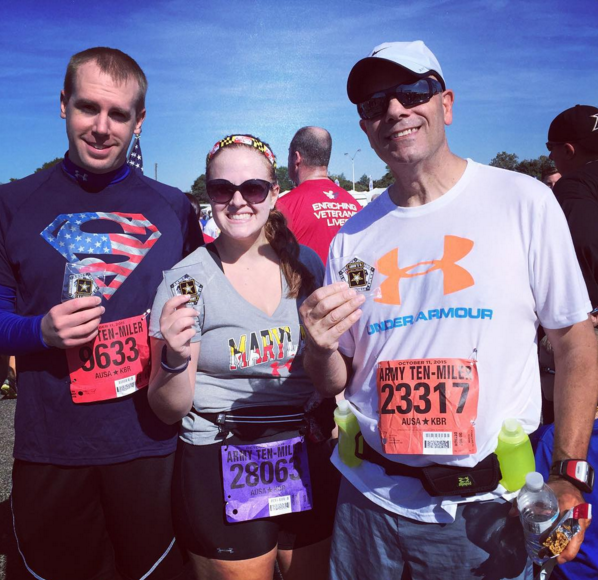 Being a DC runner and having never run the Army Ten Miler is unheard of. No really. It’s actually kind of weird. So when I knew that I would be training for the Marine Corps Marathon throughout the summer and fall, I figured why not make the ATM a speed bump in the road to tapering. Now, many of you may not know that running is a family affair. Because my family is just as crazy as I am, I decided to give my father entry into the ATM as his Father’s Day present. Who doesn’t love race entries as a gift? This would be an extra special race because my father is retired Army. Flash forward to October… On an unseasonably cold Saturday. We made our way down to the DC Armory. (I still hate that place, however it’s race expo central) We met up with my parents to make an event of the expo and grab packets in the process. Packet pick up was a well-oiled machine. 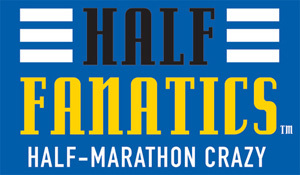 Walk in preferably with bib number and proceed to the associated line. There was little to no wait. My dad, hubby and myself all grabbed our packets, shirts, and bags and were off. My mom decided to join us, because she was in the market for some fun giveaways and fitness oriented purchases. After combing through the aisles for freebies and picking up some amazing Sparkly Soul Patriotic & Maryland themed headbands, we were all set. Race morning was unexpectedly easy. Our plan was to meet at 6:30AM in the Costco parking lot. It was a little chilly that morning, but thankfully my mom and sister decided to come cheer us on so I’d be able to keep my sweats on a bit longer. We all walked over to the Pentagon parking lot did some last minute bathroom breaks and decided to head towards our waves. Hubby is significantly faster than me and my dad so he hung out with us for a while before heading towards his speedy wave. Here’s a map… it could this year’s, it might not be. But it the correct course. The ATM is an enormous race. 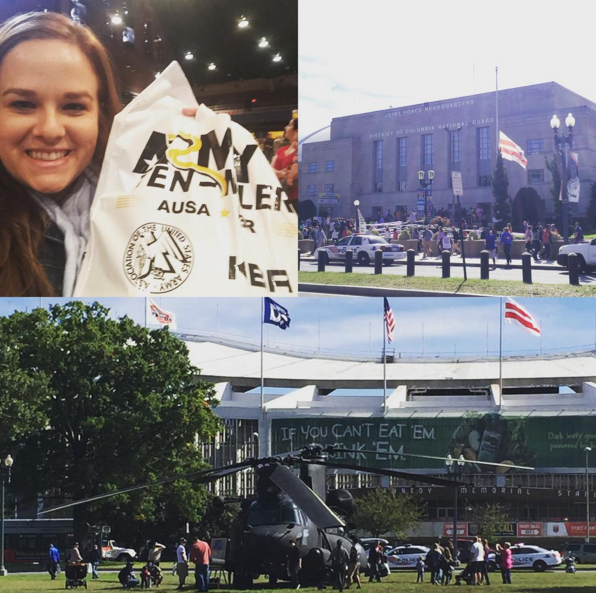 The open features a singing of the Star Spangled Banner adjacent to the Pentagon, parajumpers soar from the clouds and the outpouring of armed services participation is just overwhelming. I thoroughly enjoyed getting there early to witness the festivities. My dad and I decided that we would be running this race together. This would be a leisurely jog and we’d just be enjoying ourselves. (Spoiler Alert: Best Idea Ever). Ann, you are clearly wrong. Jogging is the best. The first mile runs through Arlington past the Pentagon towards Arlington Cemetery. During this miles everyone was so excited you could sense it. We trotted on through made sure not to drop below a 10 min mile. (I told you we were jogging.) The course then takes you next to a small portion of the cemetery up to the Arlington Memorial Bridge. At this point we were feeling great. Starting to really warm up and find a comfortable pace. After coming off the Arlington Memorial Bridge the course takes you past the Lincoln Memorial over to the streets of DC. This portion give you more of a city experience. It’s at this point where you find a long downhill that just feels great. You reach event footing again while rounding the Kennedy Center and running along the Potomac. After passing the Kennedy Center and the Lincoln Memorial again, runners make their way down Independence Avenue past the World War I Memorial and the Washington Monument towards the Capitol. 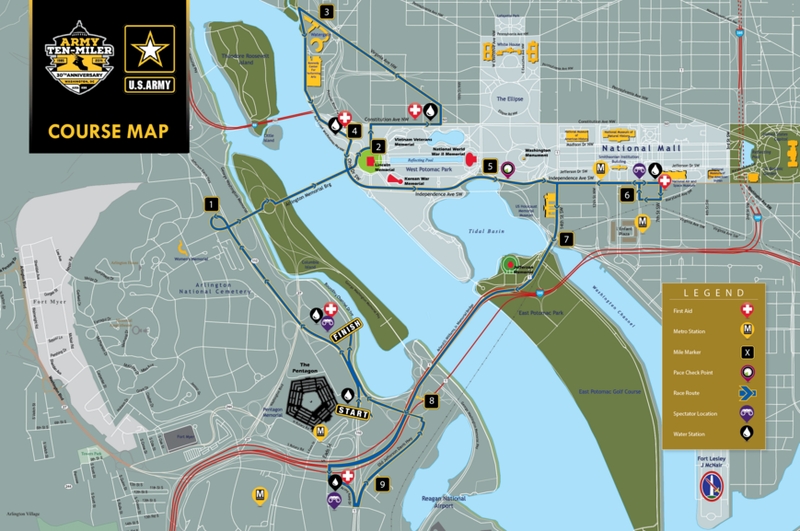 This is portion of the course offers some unique views of Washington DC and gives runners the opportunity to run through amongst the Smithsonian Institution. While on Independence Avenue there is a short out and back portion that loops around 1 block. These area was bursting with excitement. Runners were doing that Army cheer, “Ooah?” I should know this I am an Army brat and my dad must has yelled it like 50 times. After doing the loop around the block, we were heading back to VA. Well at least in that direction, we still had to conquer the 14th Street Bridge. At this point we’d been running the entire time between a 10:30 – 12:15, which we had decided was our comfortable pace zone. At this pace we could chat the entire time and really enjoy ourselves. Heading towards the bridge I was nervous. I’d heard it was rough, which is intentionally why I trained on it during long runs over the summer. The bridge was warm. Which may sound weird but when the rest of the course is somewhat shady, and very temperate this wide open concrete space is suddenly borderline HOT. You can feel the sun and it doesn’t feel great. This was right around mile 8, we took a minute pause in order to gobble down some Clif Shot Blocks because I needed sugar. I could feel it. I probably waited too long to fuel. But power through right? So after the 1 minute gobble break, we were moving right along. We crossed the bridge into Crystal and knew that we were almost there. After running through some smaller streets in the area were en route to the Pentagon. Before we knew it we were crossing the finish line side-by-side and being funneled through the chute to pick up our finisher’s coins. This could be my favorite race of 2015, if not one of my favorite races ever. Running with members of the Armed Services is inspiring. The ATM has one of the best courses in DC. That mass of people that are running with you can be a blast. But more importantly I ran this race with my dad, also a runner and likely the reason I became a runner in the first place. We have run other races before (a few 5Ks here and there) but there was something special about running THIS race together, it meant so much more and the fact that I could run side-by-side meant the world to me. I made them take this photo, but I love it. Have you run the ATM before? What’s your favorite race? But more importantly why… was it location, PR, company or something else? Nice work! I’d like to run that one someday. One of my favorite races is the Marine Corps Marathon because it’s an amazing course and I love D.C.!! Thanks! It is a fantastic race and I would strongly recommend. My wife was in DC during this race but she was at a conference. I was jealous that I couldn’t take her place and join in on the race. Thanks for the recap. Thanks! It’d be hard not to jump in! Had a great time! Thanks Sam & Mike!